Summit Audio's high-end designs are known for their quality and longevity - so is their new compressor a classic in the making? Californian manufacturers Summit Audio have a history in the pro-audio business dating back to 1979, when they started providing a brokerage service for high-end audio, but it wasn't until 1985 that the company released their first product — the TLA100 Tube Levelling Amp. I reviewed its smaller sibling, the TLA50, in SOS March 2003, but the TLA100 is still in production 20 years on! The Summit Audio DCL200 reviewed here is a dual-channel compressor/limiter employing hybrid circuitry. It combines both valves (three screened 12AX7 double triodes) and solid-state technologies (principally Deane Jensen-designed 990 op-amp devices, complemented with a couple of OP297s and some traditional 5534s) to deliver reliability with a 'precise but warm' sound. Interestingly, Summit Audio use a regulated heater supply voltage for the valves, which they claim increases their useful life considerably, with more than 10,000 hours being recorded! The input and output stages, as well as all of the side-chain circuitry, are solid-state, while the signal amplification is performed by the valves. The unit occupies 2U of rack space and extends roughly 10.5 inches behind the rack ears. The construction is to a very high standard, with a linear power supply fed from a transformer mounted on the right-hand side of the case. The majority of the circuitry is contained on a main PCB covering most of the floor area of the unit and carrying the three valves and four 990 op-amp blocks. The input and output XLRs and side-chain insert TRS sockets are cabled back to the main board, and two daughterboards mounted behind the front-panel controls carry the side-chain and gain-reduction circuitry. The mains input is via a standard fused IEC mains inlet, with a recessed switch to change mains voltage (115 or 230V). 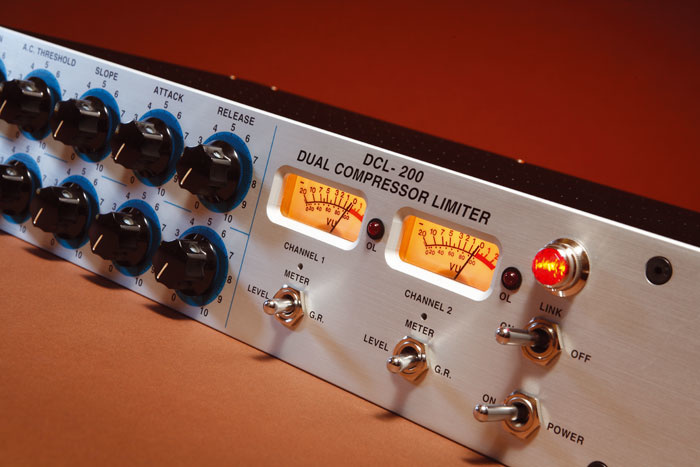 The front panel of the DCL200 is a riot of vintage flair. The two channels' controls are arranged one above the other, starting with a toggle switch to bypass the channel's gain reduction (the signal circuitry remains in the path). Next up are five large, vintage-style rotary controls, with a blue, graduated legend calibrated simply 0-10. The manual explains that these arbitrary markings are employed because the controls tend to interact with one another, and so the actual parameter values vary with the amount of gain reduction. The input Gain, Threshold, Slope (ratio), Attack (roughly 0.1 to 100ms) and Release (about 35ms to 10 seconds) can all be adjusted with the continuous (rather than switched) and surprisingly light controls. The blue, graduated legend on the vintage-style knobs is calibrated simply 0 to 10 because, according to Summit, the controls tend to interact with one another, which means that the actual parameter values vary with the amount of gain reduction. Photo: Mike CameronThe Slope control allows the compression ratio to be varied between 1.1:1 and 7:1, always with a soft-knee transition. The actual gain-controlling element is described as a proprietary design and, as it is hidden away from view on the undersides of the daughterboards, I can't tell you anything more about it. However, the side-chain is of a peak-detecting type (rather than an RMS-level design), and it sounds VCA-based rather than optical to my ears. To the right, a pair of modern back-lit rectangular VU meters each have an associated red Overload LED and a toggle switch to display either the output signal level or the amount of gain reduction being applied. The Overload LED means exactly that — it illuminates when the signal is within 0.5dB of clipping — while the 0VU mark equates to +4dBu when the meter is switched to show output level. Finally, there is a 'jewelled' On lamp and associated mains-power toggle switch, plus a Link toggle switch to gang the two channels for stereo operation. In this mode the Threshold, Slope, Attack and Release controls of the upper channel determine the compression characteristics of both channels, but the Gain, Bypass and metering controls remain independent. The Release control can set an unusually fast time, so some care is needed when you're working with bass-rich signals, to avoid waveform tracking. This is where the amount of gain reduction follows the instantaneous signal waveform, rather than the average level, modulating the signal and resulting in audible distortion. Inputs and outputs are electronically balanced, with a 40kΩ input impedance and a 75Ω output impedance. The maximum output level is a healthy +25dBu and frequency response is quoted as extending between 5Hz and 70kHz. The noise figure is a little disappointing, at -96dBu (unweighted), while distortion is better than 0.05 percent at +4dBu. The DCL200 is very simple and intuitive to use, with all the controls working entirely as expected. The lightweight action of the knobs doesn't seem to sit properly with the visual impression the unit creates, but that is a very minor quibble. I tried the DCL200 on a variety of sources, all with excellent results. Bass guitars and double basses were controlled well with medium-to-slow release settings — although, as expected, the fastest release times did cause a few nasty side-effects. The rear panel hosts the main analogue inputs and outputs on XLR, as well as side-chain inputs.Photo: Mike CameronOn vocals, the DCL200 is fabulous, controlling dynamics supremely well, while also fattening and warming the voice in a very musical and flattering way: I can see why so many producers and engineers rate this box so highly. I also tried the unit as a bus compressor on some string overdubs and found it very effective indeed in creating a silky-smooth track. The inclusion of an insert point for each channel is very useful, as it allows frequency-conscious compression effects for de-essing and auto-ducking. Using a standard Y-cable, I hooked up an external equaliser to prove that the system worked, which it clearly did — although, of course, the insert connectors operate unbalanced. The Insert input (tip) connection can also be used to accept a control-signal input to trigger auto-ducking. With the DCL200 strapped across the output of a front-line submix, feeding a split of a vocal track into the insert socket (with the unit in Link mode) caused the front-line instruments to drop in level by an amount determined by the Slope and Threshold controls. To be honest, I'm not a fan of using compressors in this fashion — there are, in my opinion, better solutions to these types of requirement. However, the fact remains that the DCL200 can be used in this kind of way, and the results are pretty good. The sound of this compressor is a well-balanced blend of benign valve warmth, with gentle harmonic overtones, but remaining bright, clear and quite modern. This unit seems to enjoy being driven hard, and certainly its character shines through most clearly when used in this way. However, even when pushed, the soft-knee transition ensures that the compression is never that obvious: appropriate attack and release times can always be found to ensure it doesn't pump, like so many compressors do when hammered. Equally, if it's used to apply only a very gentle squashing of a few decibels, the sound is quite sublime — warm and full, smooth and delightfully controlled. Clearly, this is a very expensive product, but — bearing in mind the ever-present law of diminishing returns — the sound certainly lives up to expectations. At this position in the market, there is a wide variety of very interesting alternatives to the Summit Audio DCL200. For example, the Chandler TG1 is based on a classic design and provides lots of 'attitude' in the way it controls dynamics. Then there are more transparent designs, like the CraneSong STC8 (although that can also be 'opinionated' when required), the Focusrite Red 3 and the Maselec MLA2. Well known valve units at this kind of price include Manley's Vari Mu units and Thermionic Culture's Phoenix. Then at the more 'interesting' end of the scale are the Empirical Labs Distressor EL8S and 8XS and Tube Tech's LCA2B and their multi-band SMC2B. Decisions, decisions! Hybrid circuitry gives best of all worlds. 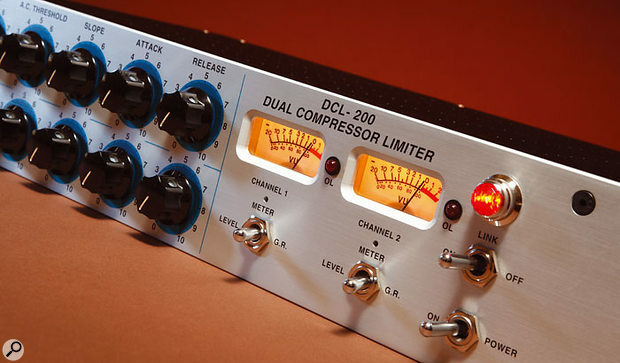 The DCL200 is a two-channel hybrid compressor that has vintage styling, but a modern sound. Tonally flattering and well-controlled, this is a high-end processor that is easy to use and sounds sublime.